Mesquite is best known for its use as a high-end lumber, however it also has a range of medicinal and nutritional uses. Geographic distributionNorthern Mexico and Southern U.S.
Mesquite is native to Texas and grows freely in the desert where nothing else will grow. Archaeological evidence from sites around Texas and northern Mexico suggest that the mesquite plant has always been useful to humans as a fuel and food source. Native peoples used the plant in many ways; the pods were eaten as food and the hardwood was used for making tools and musical instruments, and as fuel. In addition, the plant was used medicinally. Lowering blood sugar levels. In spite of its sweet taste, similar to molasses, mesquite has a low glycemic index and a high content of fiber, which helps regulate blood sugar levels in people with hyperglycemia and diabetes. Promoting vascular health. 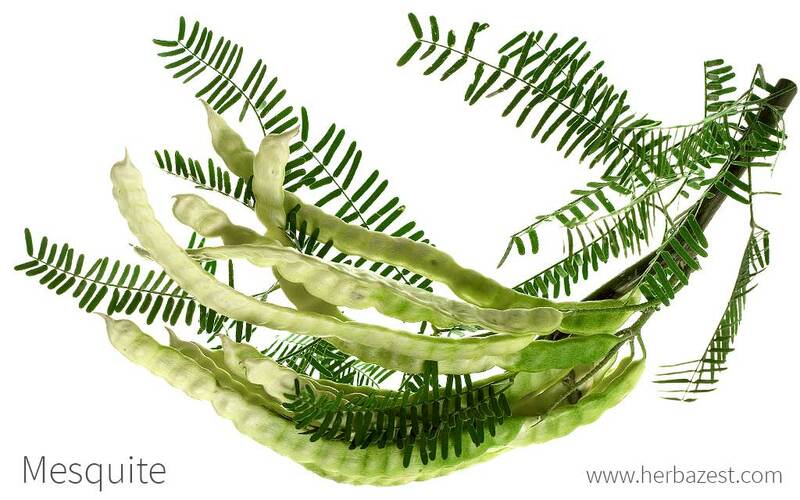 Research have shown that mesquite may play a role in improving blood pressure. Treating gastrointestinal problems. Mesquite has proven effective for relieving diarrhea, constipation, and other stomach ailments. Traditionally, the mesquite tree gum has been also used for treating sores, wounds, burns, chapped fingers and lips and sunburn. Mesquite contains phenols, which are phytocompounds with antioxidant activity, thought to be responsible for the hypotensive and hypoglycemic properties of the herb. Mesquite extract has shown the ability of blocking the activity of an enzyme responsible for transforming starches into glucose. Additionally, it prevents the body from producing angiotensin II, a substance that narrows blood vessels and releases hormones that raise blood pressure. Other herbs that lower blood sugar are yacon and lucuma, whereas bilberry and saffron also contribute to stabilize blood pressure. Mesquite doesn't have many side effects. However, it is not widely consumed so not many side effects are known. It is also not recommended to take mesquite in medicinal doses or for extended periods of time, since it's impact in higher concentrations is unknown. Mesquite seeds and pods are rich in protein, calcium, magnesium, potassium, manganese, iron, and zinc, all essential nutrients that contribute to the human overall health. A generous amount of dietary fiber in mesquite powder helps regulate bowel movements and promotes smooth digestion. Additionally, this soluble fiber forms a gel that slows down nutrient absorption, preventing blood sugar spikes after meals heavy in carbohydrates. Mesquite also provides lysine, which is one of the nine essential amino acids that the human body require for growth and tissue repair. Grinding mesquite pods into a powder or flour was practiced by the Native Americans originally, and this is still done today. This powder can be used in many recipes, including being added to soups, gravies and sauces, casseroles, vegetable and meat dishes, and pie crusts. Mesquite blooms also yield a delicious honey, and the pods can be eaten raw. Powder. This is the easiest way to use the ground seeds and pods of the plant. Mesquite powder can be used to enrich foods and smoothies with an extra dose of nutrients and digestive fiber. Gum. Taken directly from mesquite trees, this gum can be applied topically over irritated of infected areas of the skin, as well as for soothing sunburns and dry skin. Liquid extract. The dried seed pods and wood are used to extract the main compounds of mesquite. 30-50 drops can be diluted in a glass of water or juice and taken 2-4 times daily, between meals, in order to relieve gastrointestinal problems, such as indigestion, diarrhea, and constipation. Tincture. This is an alcohol-based preparation that also concentrates the medicinal properties of mesquite and needs to be diluted before consumption. Capsules. Mesquite powder also can be found in supplemental form, as a convenient way to reap the benefits of mesquite in standardized, daily doses. Mesquite seeds and pods are normally cooked or ground into flour, which can be found in organic markets, farmers' markets, and specialized health shops, but online retailers stock the wider variety of brands, readily available for purchase. Mesquite can also be found in concentrated forms, as a tincture or liquid extract, in some specialized herbal stores and through online retailers. Mesquite capsules, on the other hand, are not as common as the powder, but can be purchased online. It is also possible to buy mesquite honey from specialized food stores and organic markets. Mesquite is a perennial tree, and can grow in almost any soil that is not soggy. It thrives naturally in desert areas but, given the right conditions, mesquite plants can be cultivated at home. Seeds must be soaked and stored at low temperatures (scarified and stratified), before being planted in order to ensure germination. They are first sown 1/4 inch (6.35 mm) deep in pots of peat moss and kept at an ambient temperature of 80-85° F (27-29° C). After the seedling has reached five inches (127 mm) tall, it is transplanted into ground with some organic matter added. Mesquite is extremely heat and drought tolerant, and it is so good at drawing water from the water table that it often out-competes other plants. Even so, it should be irrigated frequently early on to promote a healthy root system. Like other members of the legume family, mesquite roots coexist with symbiotic bacteria that fix nitrogen in the soil. The plants bloom in spring, summer, and fall, and regular pruning will help them develop a strong branch and trunk structure. Mesquite can grow as a shrub, or a small or medium tree with bipinnately compound foliage. The mesquite itself can reach heights of 30 feet (10 m) and widths of 40 feet (12 m), with thorns that can be up to 2 inches (5 cm) long. In the spring, summer, and after rains, it is covered with fragrant white flowers, and the long bean pods are attractive and are a good source of food for humans and livestock. Mesquite, or Prosopis pallida, is a member of the Fabaceae family, also known as the legume, pea, or bean family, which encompasses about 19,400 species spread out over 730 genera. Some economically and medicinally important members in the Fabaceae family are alfalfa (Medicago sativa), peanut (Arachis hypogaea), fenugreek (Trigonella foenum-graecum), soy (Glycine max), and tamarind (Tamarindus indica). Mesquite belongs to the Prosopis genus, which comprises 35 species, including P. pallida. As the plant has not been domesticated, there are no recognized varieties or cultivars of P. pallida. However, thanks to the large area of distribution of the Prosopis genus, there are different closely-related, albeit distinct, species that have been known as "mesquite." Among the most common relatives of P. pallida are honey mesquite (P. glandulosa), screwbean mesquite (P. pubescens), and velvet mesquite (P. velutina). Historically the wood was used to make cordage, which was then attached to harpoons to spear large marine animals. Mesquite rope has also been used to tie reeds together for the purpose of making boats. The first European mention of the Native American use of mesquite was in the early 16th century. During the Civil War, mesquite beans would become a substitute for coffee beans when food was scarce, and early freighters would use the beans to feed livestock when grasses failed. Mesquite is one of the most economically important plants in Mexico's arid and semi-arid areas. There is a major carpentry industry surrounding the wood, which creates many jobs in these areas and supports countless families. The wood is hard and durable and used to make furniture and crafts. The mesquite plant also has a niche in the health food industry, mainly with regards to the delicious honey and flour that are produced from this plant. In addition, many rural communities rely on mesquite, as the trunks burn well to produce fuel, and the plants also replenish nitrogen levels in previously unusable soil, making it fertile again. Fuel. Mesquite wood provides an excellent fuel, and is still used by rural communities. It is also used as windbreaks, shade, and animal fodder. Woodworking. Mesquite is used to make high-end furniture and other wooden products. It was also historically used by Native Americans to make musical instruments. Cooking. In the Southwest, mesquite charcoal is used in barbecues, as the smoke gives the food a distinct mesquite flavor. USDA Plants Database, Classification for Kingdom Plantae Down to Genus Prosopis L.